Above, nature red in tooth and claw. On Tuesday 28th May 2013 the 593th draw of the Euromillions lottery took place. It has been reported that a UK ticketholder has come forward to claim the £81,381,673.30 sum, which sees the ticket-holder at number six on the National Lottery Rich List. British Gazette readers know well this organ’s advice to the winner: Go public. The alternative is to live a lie. The winner should know that to successfully keep a secret the fewer people who know, the better. This means not telling one’s nearest and dearest. It also means not spending much of the money! Of course, in order to enjoy this great wealth whilst remaining anonymous it will be necessary to tell one’s immediate family. It will mean moving. Keeping the win a secret will mean lies. Lies told not only by the winner but their spouse/partner and children. Mature consideration should cause a wise person to realise that “going public” and enduring their “15 minutes of fame” is the only sensible thing to do. 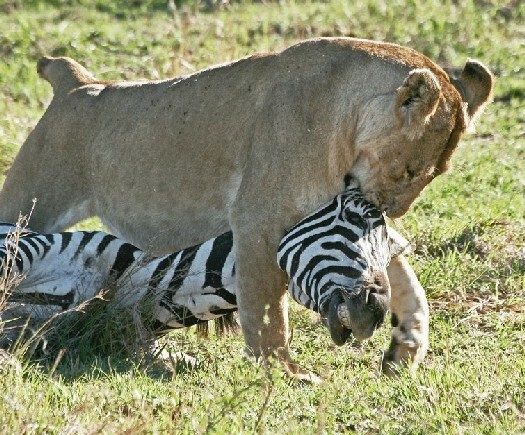 Should the winner foolishly decide to remain anonymous, they should realise that the British tabloid press will hunt them down with the same determined ruthlessness as the lioness did with the unfortunate zebra above.